George Graham Reviews The Dunwells' "Blind Sighted Faith"
Ever since the British pop music invasion started some 48 years ago, the bands from the UK have found receptive audiences on this side of the Atlantic. And while today's commercial pop charts are not dominated by rock bands as they once were, there is still something of a steady stream of contemporary Brit-pop. The best and usually the most successful British bands are those which combine trans-Atlantic influences, the very American elements of rock and roll, blues and some folk influence. The bands that now dominate the stuck-in-a-timewarp rut media known as "classic rock," largely emerged from the British blues movement, which helped to introduced then-young American audiences to very American blues. And the Beatles acknowledged their strong influences in some of their songwriting by the folkies like Bob Dylan. This week we have the debut recording by a band from Leeds, England, that is a nice timeless blend of influences from both sides of the Atlantic. 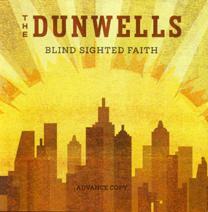 They are called the Dunwells, and their CD is called Blind Sighted Faith. Clever as the band's name may be, the group actually is co-led by two brothers named Dunwell, David and Joseph, who came from a musical family. Their father is a classical guitar player with an extensive record collection that dates back to the earlier days of the British Invasion, including The Beatles, and Fleetwood Mac. Both brothers started in music at an early age, but began writing songs a few years ago. They played in local pubs separately, before a booking agent suggested that they start working together. They were eventually joined by a pair of cousins, bassist Rob Clayton, who was a long-time personal friend of David Dunwell, and drummer Jonny Lamb. The group is rounded out with guitarist Dave Hanson, who became a fan of Joseph Dunwell after seeing him play. In addition to a kind of roots folk-influenced music, The Dunwells are strong on vocal harmonies, often five-part singing that can be reminiscent of a somewhat expanded version of Crosby, Stills and Nash. The CD was produced by John Porter, a prominent producer who works on both sides of the Atlantic, and has produced recordings by Bryan Ferry, The Smiths and Ryan Adams and even B.B. King. Porter also happens to be from the city of Leeds. They were signed to an independent label called Playing in Traffic Records, some of whose other artists have also worked with Porter. The combination of the quality songwriting and youthful enthusiasm of the band with Porter's long experience with various styles, results in one of the more impressive rock-band debut albums in quite a while. Further adding to the British and American blend of influences, a good portion of the CD was recorded at Willie Nelson's studio near Austin, Texas, as well as in the band's hometown of Leeds. The result is a bright, attractive album with first-rate musicianship and songwriting that draws on timeless ingredients and uses them on a natural organic way. The Dunwells don't really break any new musical ground, but their music does not come off as slavishly retro either. There are some more contemporary influences one can hear from time to time, but most of the sound could be described as folky rock, with a prominent strumming acoustic guitar on just about every track. Blind Sighted Faith, the new debut CD by the Leeds, England-based band The Dunwells, formerly known as the Dunwell Brothers Band, is a worthwhile and satisfying recording by a group that draws on long-running traditions from both America and England with a good helping of roots rock elements, strong vocal harmonies along with some influence by British pop bands. The playing and especially the vocal harmonies are impressively strong, and the tasteful production is first-rate. They don't break much new ground in their music, instead show how well they have absorbed the ingredients that have stood the test of time, but have come up with relatively cliche-free music. Our grade for audio quality is about an A-minus. The mix has good clarity and there is a pleasing avoidance of trendy studio effects. But the dynamic range is mediocre. Forty eight years after the start of the British invasion with the Beatles, there are still a number of worthwhile new bands emerging from the other side of the Atlantic. The Dunwells are an excellent example of such a group who draw upon some of the same influences as their storied predecessors, and still make music that is still very much their own.